This routine has been part of my act for the last 20 years. 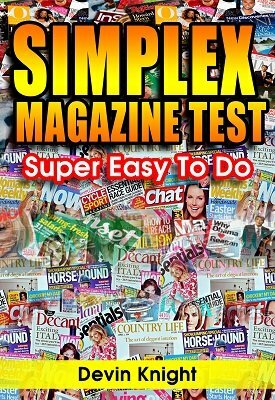 An easy and novel way of performing a magazine test without any specially printed magazines, duplicate pages, external cue lists, or memory work. All you need are two magazines that you can get in any grocery store. A spectator chooses one of them and another spectator calls out a page number. He turns to the page and notes the first word on the page. The performer then reveals the word with NO FISHING or can show it was previously predicted on a white board. No secret peeks or sleights, it's self-contained and so easy to do. You will not believe it. The method allows you to focus on presentation by not having to worry about getting the word. Your participant can even keep his magazine as there is nothing to find. Two different presentations are given. For $6, this is a great magazine test that is worth much, much more. Get a couple of different magazines, spend about 20 minutes preparing, and you are ready to go. (I use copies of two Mensa magazines. Seems appropriate. :)) It uses an old book-test principle, but once again, Devin has put together a dynamite effect that will work for close-up, parlor, or stage.